this is part two in a series on healthy eating. read part 1 here. this is one thing we’ve gotten a lot of questions about, how we do meat on this diet. we buy organic free range chicken, grass fed beef, and all natural pork products (like hot dogs and bacon). we buy all of our meat at jimbo’s and trader joe’s. sometimes at sprouts or costco when we hear that they have something in that meets the requirements! buy an organic free range whole chicken…what? a whole chicken?! yes, a whole chicken. 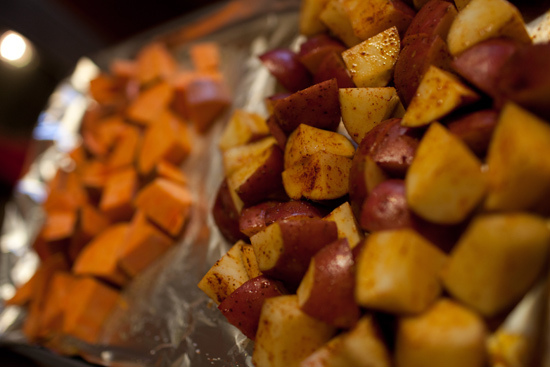 if you’ve never made one, you’re in for a pleasant surprise, they’re super easy and taste just like the cooked ones you buy whole at vons, albertsons or costco, plus they make your house smell like what i think martha stewart’s house might smell like. so why don’t we just buy one of the ready made chickens? first of all they aren’t organic/free range/hormone free (they might be but they don’t advertise that they are). and if you read the ingredients, they do not use all natural ingredients to cook/season their whole chickens. 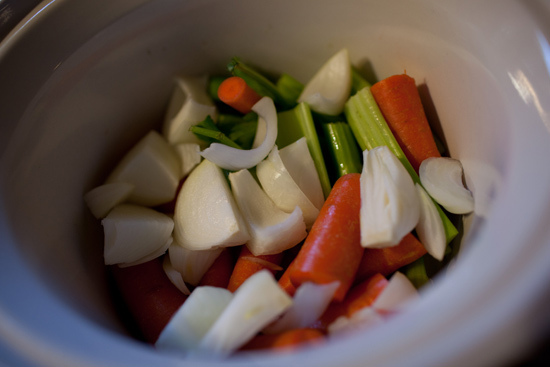 1. get out your crock pot, cut up 4-5 organic carrots, 3-4 stalks of organic celery and an organic onion and put them in the pot. 2. unwrap your chicken (this is the hardest part for me because touching raw chicken is one of the most disgusting things in life – first world problems i know!) remove any giblets that came with it (heart, liver, neck etc..) don’t throw those away though because although we don’t eat them i let them cook with the chicken so we can get some of the nutrients. also i give the heart and liver to my dog afterward and she LOVES them! 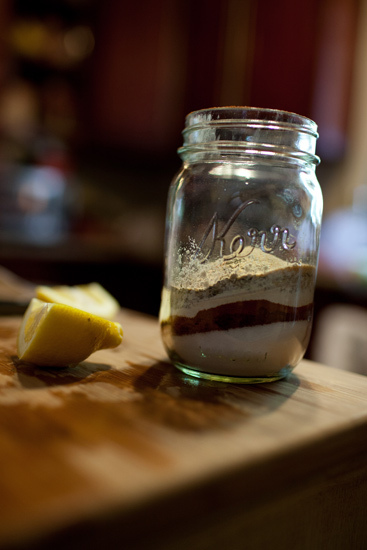 *optional – put a quartered lemon inside, i have done it both ways, and jared likes it better without so there you have it! 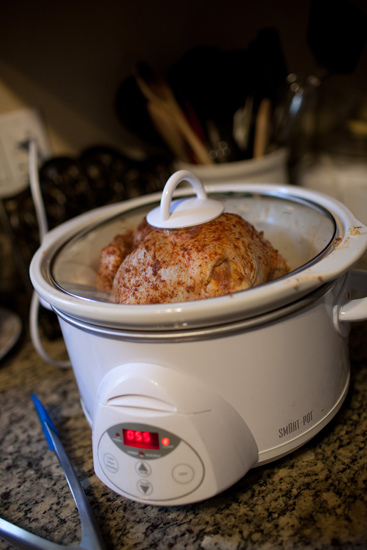 plop the chicken in the slow cooker on low for 4-8 hours depending on weight, a 4 lb chicken usually takes about 6 hours. just make sure that the temp is 160 degrees to be sure it’s done. this recipe calls for broiling it afterward but i never do that and it’s delicious. then i go about making this puppy last! once we’re done eating, i pick all the chicken off the bones and store it in an airtight container in the fridge. this shredded chicken lasts for 2-3 more recipes that usually yield leftovers (for a family of 2) so we really get quite a few meals out of one chicken. we’ve made bbq chicken pizza, tacos, chicken bakes, enchiladas, pretty much anything you can think to do with leftover chicken. after i’ve stripped the bones, i dump the whole crock pot full of carcass and veges into a pot on the stove. i have a really great feature on my pot and it has a strainer that fits in it so that when i’m all done it’s easy to throw everything away and just have broth left. then i put enough water in the pot to cover all the food but don’t fill it too high or it will boil out. 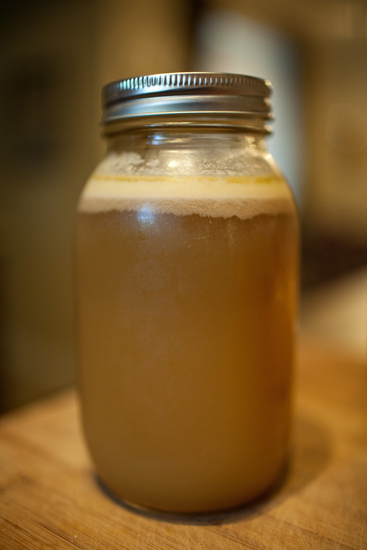 i boil that for about 2-3 hours and voila, homemade organic chicken stock! with the chicken stock, you can make chicken tortilla soup (with leftover chicken), any other type of broth or even pureed vegetable soups, or rice or couscous. i know it sounds like a lot of time 2-3 hours, but you are just letting it sit there and do it’s thing while you can do laundry or watch tv. look at that golden deliciousness!